The Miniature Schnauzer is one of the most well liked terrier breeds and pets. It has many popular house pet qualities, including being full of life, friendly, aware, and curious. The manners of the Miniature Schnauzer are well suited for a home environment. Its sociable nature makes it want to be a part of all of the activities with the family. The Miniature Schnauzer has a less aggressive nature then the larger Schnauzer breeds, and tends to get along better with other animals then other breeds of terriers. It also is a good dog to have around children. It is generally obedient, but can be stubborn at times. The Miniature Schnauzer may have a tendency to bark often. The Miniature Schnauzer is a high-energy breed that has a healthy requirement for physical activity. These requirements can be met with a decent leash walk or a play session outdoors. It has the ability to survive in outdoor environments with climates that are temperate to warm. However, the Miniature Schnauzer is better suited for life indoors with a family to meet its emotional needs. Maintaining the white coat of the Miniature Schnauzer requires combing one to two times per week. It may also need clipped and shaped every few months or so to soften the texture of the coat. Urolithiasis is one of the main health concerns for the Miniature Schnauzer. This condition involves the urinary tract and the formation of stones in the tract. Another major concern is PRA, or Progressive Retinal Atrophy, which involves a disease of the eyes. There are several minor health concerns for the Miniature Schnauzer, which include Schnauzer comedo syndrome, vWD (Von Willebrand’s Disease), myotonia congenita, and allergies. Occasionally seen in this breed are cataracts, retinal dysplexia, and mycobacterium avian infection. The suggested tests to keep the Miniature Schnauzer healthy are testing of the eyes, DNA tests for PRA, vWD, and myotonia congenita. The average life span of this breed is 12 to 14 years. The Miniature Schnauzer is the only terrier variety that did not come from European Isle stock. It came form Germany in the late 1800s where it was originally a farm dog. It is derived from a combination of the Standard Schnauzer and the Affenpinscher. There are also theories that the poodle played a part during the crossing of the breeds. The name Schnauzer comes from a single dog with the same name that was shown in 1879. The Miniature Schnauzer became shown and its own distinct breed separate from the Standard Schnauzer in Germany by 1899. It was recognized by the 1933 as its own breed as well. In America today, the Miniature Schnauzer remains the only Schnauzer still considered a part of the Terrier Group. Conversely, it is in the same group as the other Schnauzers in England, which is known as the Utility Group. 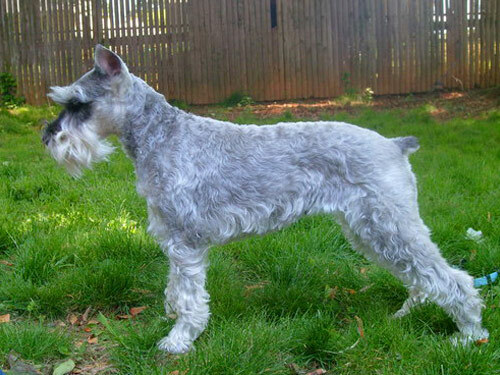 The Miniature Schnauzer arrived in America at a later time then the Standard, but quickly climbed in the popularity ranks to take the third position of most popular dog in the United States. Today its popularity persists as both a house pet and show dog.